Scrum training in a team setting provides a powerful set of principles and practices that help teams deliver products and projects in shorter cycles, enabling for fast feedback, continual improvement and rapid adaptation to change. We have seen the popularity of this project management framework explode as it has expanded in adoption from its development for software projects to its use for other complex scopes of work. Scrum eliminates the traditional Project Manager and moves your team in a direction of self-organization and governance. 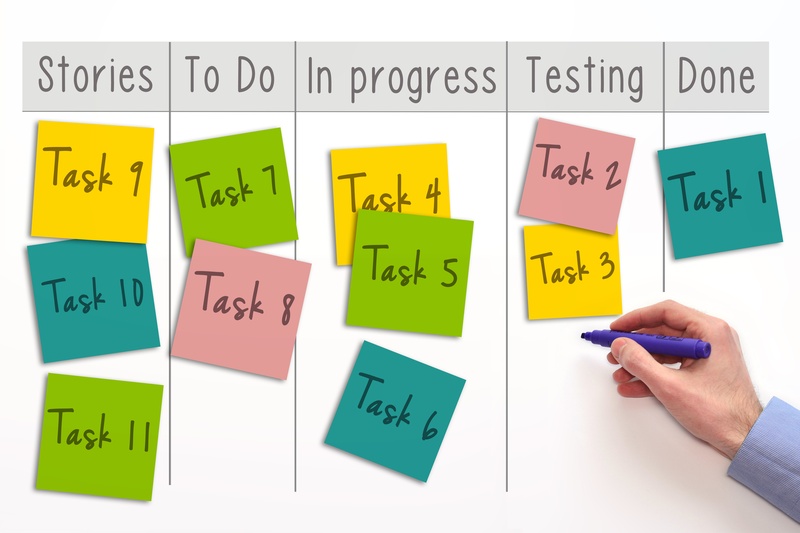 Scrum can help with managing tasks for large projects, it also helps with improved teamwork and enables better communication for faster results. Anyone who has a complex project can benefit from using Scrum. Whether you’re building the next great app, managing shipping routes and schedules, or planning a large enterprise event, you can use the Agile Scrum framework for your project. Group courses delivered by KnowledgeWave are taught by Certified Scrum Trainers (CST) recognized through the Scrum Alliance. KnowledgeWave can also assist teams by providing Certified Team Coaches (CTC) and Certified Enterprise Coaches (CEC) to work with your teams on your real-world projects. Our private group classes for Scrum provide the opportunity to earn the Certified ScrumMaster (CSM) and the Certified Scrum Product Owner (CSPO) certifications. KnowledgeWave also provides open enrollment course for Scrum Certification. Our open enrollment courses are available to the general public and run as a live class that students attend remotely online. These courses provide the opportunity to test and class participants can earn Scrum Master Certified (SMC™) and Scrum Product Owner Certified (SPOC™) certifications. Scrum Master Certified (SMC™) professionals have a practical, working knowledge of Scrum that equips them to implement and work in a Scrum environment. The purpose of the exam is to confirm the applicants have achieved sufficient understanding of how to apply Scrum in the projects and to tailor Scrum in a particular scenario. SMC™ professionals are facilitators who ensure that the Scrum Team is provided with an environment conducive to completing the project successfully. The Scrum Master guides, facilitates and teaches Scrum practices to everyone involved in the project, clears impediments for the team, and ensures that Scrum processes are being followed. Successful candidates will be awarded the Scrum Master Certified (SMC™) certification after passing the included certification exam. The Scrum Product Owner Certified (SPOC™) certification exam is designed to confirm applicants practical and working knowledge of Scrum that equips them to handle the business aspects and stakeholders in a Scrum environment. Product Owner represents the interests of the stakeholders in the Scrum Team. Commonly called ‘the voice of the customer’, the Product Owner is responsible for ensuring clear communication of product or service functionality requirements. The Product Owner also prioritizes the requirements from the point of view of an end user, for maximum business benefit, defines the Acceptance Criteria, and ensuring those criteria are met. Applicants will be awarded the Scrum Product Owner Certified (SPOC™) certificate by successfully passing the certification exam.